Take steps in a trendsetting direction with these captivating sandals, featuring faux suede braided straps and a slingback design. Great olive color. I normally wear a 7 1/2 originally ordered an 8 but it was too long. Went back and got the 7, better fit. 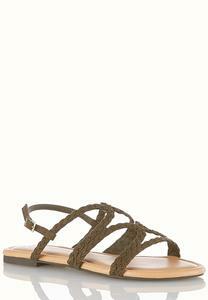 Cute sandal for summer dresses.